Alright, it’s late, I’m tired, let’s check things out. and how crucial they are to your strategy. Done. Witticism regarding black hole suction. think it was bringing out some stunning upsets. Ultra Space (FLI 115) materialized from the Forbidden Light expansion set. This Stadium card allows you to search your deck for an Ultra Beast card AND put it into your hand. This is great because then you can use Kartana’s and Nihilego’s abilities. I found this card to be essential in my Naganadel Beast Box deck. I have also seen Buzzwole players use it as well. Overall, however, most decks won’t have much use for it. Dawn Wings Necrozma GX is about the only Ultra Beast seeing play in non-Buzzwole or non-Naganadel archetypes. And the Ultra Beast craze might just be slowing down. There are only a couple coming out in Celestial Storm, and they look alright but not super impactful (no Ultra Beast with the ability to draw cards) although Stakataka might be valuable if its ability (reduce damage by ten) stacks (pun intended). As we continue to get Ultra Beasts, the playability of this card will only increase. However, if the Ultra Beast era is starting to die down, we might see even less of this card in the future. Completely unrelated to Ultra Space (considering no top finishing deck since FLI became Standard legal has carried it), but I published another compilation of data on top decks from most of the tournaments since May 19th. Lots of really great data to munch on, it gives very good insight into where the meta has gone since FLI. Another day, another card nominated for our countdown of the 10 best cards from SM – Forbidden Light but which didn’t actually make the final cut. Ultra Space (SM – Forbidden Light 115/131) is a Stadium card that allows the turn player to search his or her deck for an Ultra Beast and add it to hand. Surprisingly, it does not specify that you must do this before you attack even though that is how it works, though it does still include the reminder text that you must show your opponent the card you searched out (so that you cannot accidentally or intentionally grab a non-Ultra Beast). 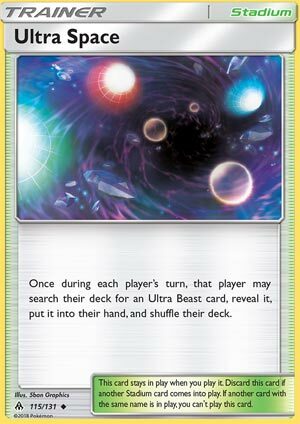 Ultra Space is the default Stadium for Ultra Beast decks. Which does not mean it is a true staple for Ultra Beast decks. If another Stadium helps more, you either run both or just the other Stadium (whatever your list permits). A free search tends to be great whether you need the card or not; you’ll always get a quick peek at the current contents of your deck (even if you lack any Ultra Beasts), and may attempt to thin your deck while snagging discard fodder. Ultra Space has a place in Ultra Beast focused decks for both the Standard and Expanded Format, though again let me stress that it may not always be the best Stadium for an Ultra Beast deck. The best example would be how Buzzwole-GX decks are going to benefit more from Brooklet Hill, which can get their [F] Type, non-Ultra Beast support to the field as well as Buzzwole-GX itself. Ultra Space is a must run in the Limited Format, though remember that doesn’t mean I’ll score it extremely high. Why? Even if you have no Ultra Beast decks, you may need it to discard an opponent’s Lysandre Labs, and it may also give you your first look at your own deck. If you can make use of the actual search effect, all the better. Ultra Space appeared on two of the individual reviewer lists to earn a total of 23 voting points, exactly three shy of tying yesterday’s Lady and three above tomorrow’s subject. This means it would have been our 19th place pick, had we done a large enough countdown. On my own list, I had this card as my 16th place pick; it might still clock in that high, but only because most of what I ranked lower has failed to deliver. Ultra Space does one thing and does it well. Good for decks with Ultra Beasts but useless on others.